A very good and intense drama. Kimberly Wells (Jane Fonda) is a reporter at a TV station in LA. She does mostly fluff pieces and really wants to move onto more important stories. She gets her chance when the station sends her to the Ventana Nuclear Power Plant to do a story on nuclear energy. While she is there with her cameraman, Richard Adams (Michael Douglas), and sound guy, Hector Salas (Daniel Valdez), something happens. There is an "incident" in the control room with the water pressure in the towers. The control room , lead by Jack Godell (Jack Lemmon), is in a panic and Richard secretly tapes everything. When they arrive back at the station the general manager decides they can not air the footage because Richard violated Federal law by filming the the plant without permission. However, Kimberly is not going to let that stop her. She decides to investigate the situation on her own. She talks to Jack Godell and tries to get him to help her. What they uncover is extremely dangerous and people are willing to do anything to keep in covered. A lot of people think this movie is outdated but I do not feel that way at all. There are still several nuclear power plants in operation today, one very close to me in Toledo, Ohio. The acting in this film was superb. 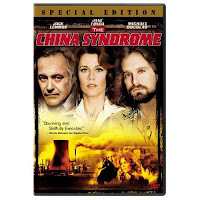 Fonda and Lemmon were both nominated for Oscars for this film. A wonderfully tense thriller still worth watching today.